Are startups growing much faster than they have in the past? 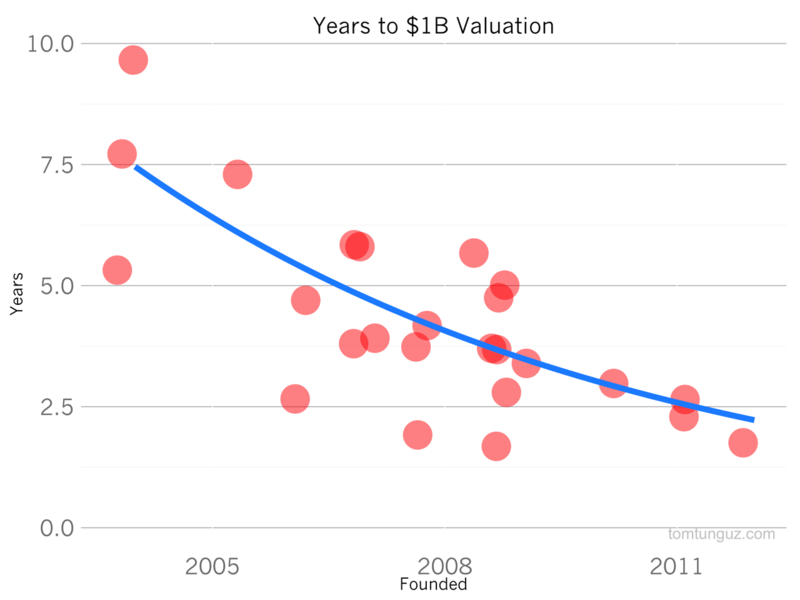 The chart above plots the time required for startups to raise rounds at $1B or greater valuation, over the past ten years. The blue line is a logarithmic regression demonstrating the decrease from about 7.5 years to less than 2.5 years. The answer seems to be an unequivocal yes. Let’s break this chart down by type of company: B2B and B2C. 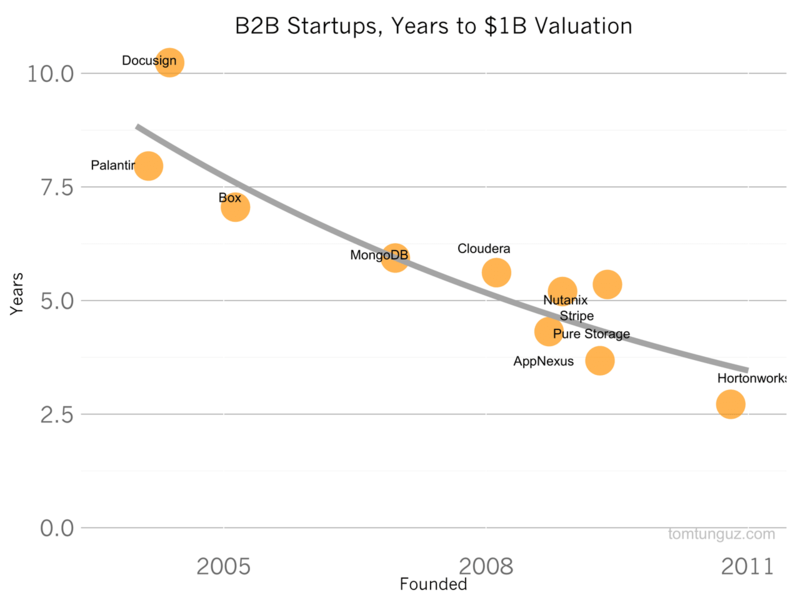 B2B companies have taken longer to reach this valuation milestones. 10 years for Docusign. 5 for Pure Storage. But only 3 years for HortonWorks. 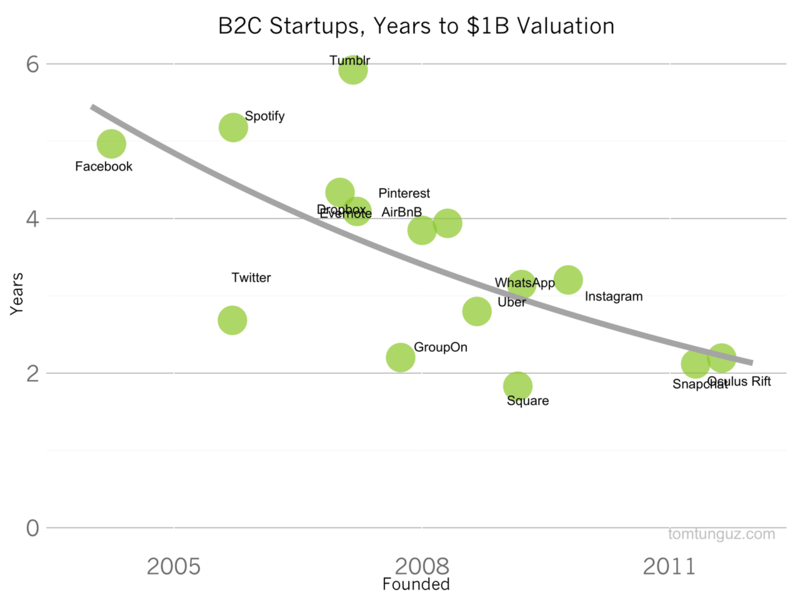 B2C companies grow much faster than B2B companies and the data proves the trend. Social networks in particular, see faster and faster rates of adoption: Facebook, Tumblr, Twitter, Pinterest, WhatsApp, Instagram, Snapchat have reached the $1B mark faster than the other, almost in lock step with their year of founding. Why is this happening? I think there are at least four causes. First and most importantly, sample bias. We haven’t yet allowed enough years for the companies founded in 2011 that require five years to reach a billion dollar value to mature, which depresses the average value. The startup founded in 2010 that takes 7 years to reach the $1B mark hasn’t yet been granted enough time to achieve it. In addition, some companies never reach the billion dollar valuation mark in the private markets, preferring to go public beforehand. ZenDesk and New Relic are two recent examples. But for the companies on this list, distribution platforms enable companies to scale much more quickly than ever before. iOS and Google Play address billions of users. A hit application or social network that captures the minds of users can achieve much faster growth rates than their web-based predecessors, and address the 10x greater population of mobile phone users compared to PC users. Enterprise platforms like Salesforce’s Force.com gave rise to Veeva, a company that raised only $4M before going public seven years after founding, now worth billions. Third, users are much more receptive to trying new technologies than ever before. Consumers trust mobile commerce. Enterprises pursue technology innovations and adopt them at earlier phases of product development, to gain a competitive advantage. Many of the biggest banks in the world have staffed technology business development teams to scout and source breakthrough technologies. In addition, open source software is a big driver of infrastructure innovation. Open source provides transparency and prevents lock-in to proprietary standards for large companies. More importantly, open source is a powerful distribution mechanism. Look no further than the containerization movement pioneered by Docker and now CoreOS, whose growth is enabled by Open Source, to prove the point. Last, the capital to finance immense growth is readily available. Startups are raising rounds that would only have been possible in the public markets five to ten years earlier. The median IPO in the late 90s was about $25-30M. Today, that’s a big Series A. In the current environment, a large growth round can top $250M. 2014 will likely be the third largest year for VC fund raising since 2000, meaning investors have more capital to invest than in quite a while. In the meantime, the number of billion dollar startups has increased, but not quickly enough to keep pace with the increase in capital. This supply demand imbalance is also leading to an increase in startup prices, further decreasing the time to $1 billion in valuation. Some startups are growing faster than ever before. These breakout companies’ market value increases dramatically through their lifecycle and they are empowered to grow faster and faster by new distribution platforms and a capital market that is hungry to fuel their growth.